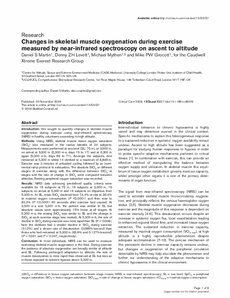 Introduction: We sought to quantify changes in skeletal muscle oxygenation during exercise using near-infrared spectroscopy (NIRS) in healthy volunteers ascending to high altitude.Methods: Using NIRS, skeletal muscle tissue oxygen saturation (StO2) was measured in the vastus lateralis of 24 subjects. Measurements were performed at sea level (SL; 75 m), at 3,500 m, on arrival at 5,300 m (5,300 m-a; days 15 to 17) and at 5,300 m again (5,300 m-b; days 69 to 71). Amongst the subjects, nine remained at 5,300 m whilst 14 climbed to a maximum of 8,848 m. Exercise was 3 minutes of unloaded cycling followed by an incremental ramp protocol to exhaustion. The absolute StO2at different stages of exercise along with the difference between StO2at stages and the rate of change in StO2were compared between altitudes. Resting peripheral oxygen saturation was recorded.Results: NIRS data achieving predefined quality criteria were available for 18 subjects at 75 m, 16 subjects at 3,500 m, 16 subjects on arrival at 5,300 m and 16 subjects on departure from 5,300 m. At SL, mean StO2declined from 74.4% at rest to 36.4% at maximal oxygen consumption (P < 0.0001) and then rose to 82.3% (P < 0.0001) 60 seconds after exercise had ceased. At 3,500 m-a and 5,300 m-b, the pattern was similar to SL but absolute values were approximately 15% lower at all stages. At 5,300 m-a, the resting StO2was similar to SL and the change in StO2at each exercise stage less marked. At 5,300 m-b, the rate of decline in StO2during exercise was more rapid than SL (P = 0.008); here the climbers had a smaller decline in StO2during exercise (41.0%) and a slower rate of desaturation (0.086%/second) than those who had remained at 5,300 m (62.9% and 0.127%/second) (P = 0.031 and P = 0.047, respectively).Conclusions: In most individuals, NIRS can be used to measure exercising skeletal muscle oxygenation in the field. During exercise the patterns of absolute oxygenation are broadly similar at altitude and SL. Following prolonged adaptation to altitude, the rate of muscle desaturation is more rapid than observed at SL but less so in those exposed to extreme hypoxia above 5,300 m. � 2009 BioMed Central Ltd.